As he tells it, composer Moe Touizrar (Ph.D. 2019) aims to communicate real-world experiences and human emotions through his music. His latest work (composed as a result of winning the 2015-2016 Andrew Svoboda Prize in Orchestral Composition) uses a full orchestra to communicate the experience of watching a sunset and sunrise. 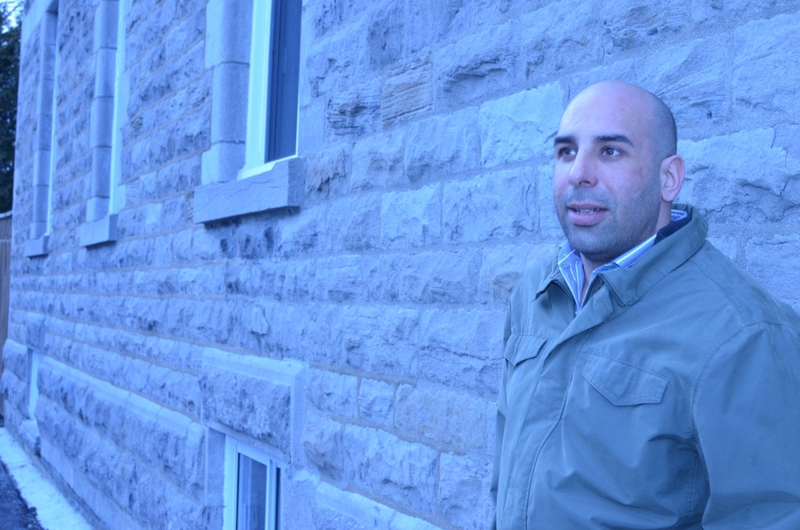 We spoke to Touizrar in a recent email exchange to learn more about the piece before its premiere by the McGill Symphony Orchestra this Friday. What does it mean to you to have won the 2015-2016 Andrew Svoboda Prize in Orchestral Composition? It’s a great honour and privilege to have been awarded this wonderful new prize. The ongoing creation of new Canadian orchestral repertoire requires that students in composition receive opportunities to interact with orchestras and conductors in order to be prepared to work as professional composers. With their generous and heartfelt gift, Mr. and Mrs. Svoboda have greatly enriched musical training and opportunity for many cohorts of composers to come. On a personal note, the opportunity to spend a year working on my first piece for orchestra is something I will cherish and remember fondly for the rest of my life. Two previous compositions that were premiered by Schulich ensembles (In the Setting Sun (Still Life) and Au bord du Léthé) are both part of a three-part cycle that will be completed with your latest work, Bright, Blue and Shimmering. Can you tell us more about this cycle and about the differences in writing for the McGill Wind Orchestra, McGill Contemporary Music Ensemble and now McGill Symphony Orchestra? This orchestral work, Bright, Blue, and Shimmering is the final piece in a three-part cycle of works that attempts to convey, in music, the experience of diminishing and then intensifying light as seen and felt during a fictional progression through sunset, night, and ending with a sunrise. Like many composers before me, I sense and experience some sort of affinity between the visual and tactile phenomenological experience of sunsets and sunrises, and certain patterns possible in music. The manipulation of instrumental timbre – the distinct difference in sound between two or more instruments – seems to me to be capable of a very powerful cross-modal metaphor for everyday experiences of the sun's light. On another, more allegorical level, the cycle traces the imagined journey of a deceased soul as they pass through the underworld, in an attempt to find peace, light and a new beginning, whatever that may be. On yet another level, this cycle is a triple experiment in the manipulation of existing musical materials. Each piece in the cycle confronts one or more types of pre-existing material such as quotes, allusions, stylistic references or musical topics, as a means of re-using the past to create novelty. The first piece in the cycle, In the Setting Sun (Still Life) for wind symphony, is a reflection on the stunning sunsets I experienced while posted in Kandahar, Afghanistan in 2010, and in Cyprus from 2011-2013 as a contractor with the Canadian Forces. My work was oriented toward the then emerging plight of Post Traumatic Stress Disorder in combat soldiers, and in this piece, I try to make musical associations between my grief having lost friends to both death and extreme psychological trauma, and the extreme beauty of a sunset under such tragic circumstances. This work was commissioned by Alain Cazes in 2013 for a joint concert with a wind orchestra from the Canadian Forces in commemoration of the First and Second World Wars. I was struck by the abundance of timbral possibilities afforded to me by the Wind Orchestra and decided that it was, in fact, possible to re-present the above-mentioned experiences using this medium. Au Bord du Léthé, the second work in the cycle, was composed as part of the composer-in-residence program here at McGill — a program vital to the training of young composers. I was assigned to write for the Contemporary Music Ensemble, and I decided that it was a perfect vehicle for the second part of the trilogy, namely the descent into an afterlife. Here, I imagine, in sound, a place mentioned by Plato in his Myth of Er, the river Lethe that all souls pass through on their journey through the ancient Greek underworld. The confusion of disembodiment, the grief and anger at a life past and the disorientation of a dark and shadowy underworld quickly pass to a transitory state – the slow wiping of memory in preparation for another state of existence – these sensations all came to mind as I composed this work, which is intended as a prelude for this new orchestral work. As luck would have it, I was awarded the Andrew Svoboda Prize a few weeks after the premiere of Au Bord du Léthé and I was then confronted with the immense challenge of not only writing my first piece for orchestra, but of trying to figure out how to end the cycle in a satisfying way – I find it easier and more natural to conceive of darker, less intense timbres versus brighter ones. Endings are always difficult, even when they are new beginnings. A few weeks before beginning the piece, I heard the news that the American composer Stephen Stucky had passed away far too young. Stucky, who was also a scholar of the music of Lutoslawski, had a unique approach to orchestral timbre, one where he often reversed traditional roles within the orchestra in order to explore new sonic possibilities. My piece is inspired by his wonderful contribution to music. The sunrise in artistic representations can telegraph or signify a number of simultaneous meanings: enlightenment, redemption, knowledge, life and even rebirth. In the musical canon, sunrises often signify beginnings and can be associated with overtures, the rising of the curtain in opera, apotheosis, etc. This new piece is in two sections. The first section, a short orchestral nocturne titled Clairobscur, uses the gradual layering of instrumental timbre to convey a dream-like state where small hints of light help to gradually intensify the overall sound, before an extremely low and laborious moment – the darkest moment before the dawn. The second section, titled Sol Invictus, progresses from twilight to sunrise via a further sonic intensification, ending with a large orchestral tutti. Can you speak about how your research on expression human emotion in music has impacted your compositional process, especially in these three works? My research in the Music Perception and Cognition Lab, under the direction of Stephen McAdams, attempts to understand the links between orchestral sonority and meaning. Typical questions I ask myself might include: How is it that specific sounds carry or denote certain meanings? How have composers used orchestral sonority to depict or re-present non-musical ideas? Timbral representations can also carry affective information. Emotions can be expressed in music and can even be induced by music. My research helps to inform my own instrumental writing, and specifically has helped me to understand how composers have invoked concepts related to light in music. What’s the experience of working with our student musicians like when rehearsing for the upcoming premiere? I have found the musicians of the McGill Symphony Orchestra to be incredibly receptive, curious and interested in this music. Of course, first rehearsals are a little bizarre for all involved. The musicians have no idea what the piece sounds like as they've only heard the one line they've been assigned to practice. The composer might be nervous, hoping he or she has attended to the many tasks in preparing the score and parts. I was delighted by the energy, work ethic, focus and commitment of the musicians, and especially of Prof. Hauser, whose warmth and dedication to music are apparent in his every interaction, both with me and with this wonderful orchestra. Hear Moe Touizrar’s newest work played by the McGill Symphony Orchestra on Friday, Nov.24 and Saturday, Nov. 25 at 7:30 p.m. in Pollack Hall. Tickets are available for purchase here.